Gutter cleaning is a safety measure that every property owner must take to avoid the clogging of the gutters and downpipes, because this could lead to severe water damage to the property. 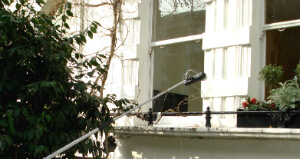 Our gutter cleaners use wet or dry vacuum cleaners and telescopic poles with cameras to locate and remove all of the twigs, leaves and other dirt. They will make sure that they get your gutters clean and will show you pictures of their condition prior to and after the cleaning. Ashlee House Cleaning offers a 30 day quality guarantee for this service. A team of gutter cleaners will re-clean if your gutters get clogged during this period. We only hire well-trained roof cleaners who can certainly deliver high quality house roof cleaning. Pressure washing devices is applied to remove mold, algae, lichen, ugly stains and any moss from roofs. Your roof has to be adequately cleaned out on a regular basis, so that your residence looks great, and so that no harm will develop due to dirt and all the other harmful clumps on it. The problem with organisms which reside on your roof is that they could destroy the roof if left untreated for long time. Our firm provides a trustworthy and inexpensive roof cleaning service, that will save you the trouble of having to climb on your roof or on a ladder to carry out the cleaning your self. Be safe, and get our wholly insured cleaning service today. In case there is nobody, who are able to care of your business building windows, possibly, the enthusiastic experienced window cleaners in Streatham Common SW16 are right here to help you. We are at the same time available for industrial window cleaning services in Streatham Common SW16. All kind of industrial properties are accepted: restaurants, hotels, offices, IT buildings, stores. Note that our special safe system for window and gutter cleaning can reach up to 4th floor. Conservatory window cleaning orders are also accepted! We have a highly effective system for service bookings. Our client support reps are available 24/7 to process your demands. Just call 020 3746 1366 or fill in our booking form. Throughout the following 2 hours you will get an e-mail affirmation for your reservation. Our expert window cleaners will thoroughly clean without any ladders and without lurking into your house windows if you are up to the Fourth floor. Our services come at good rates, with no concealed fees. Book more than 1 service and you can spend less both time and money. There are preferential offers for those who book earlier, for our frequent clientele, as well as for local property firms and property admins. And so, if you really want your windows perfectly cleaned - get our window cleaning Streatham Common SW16 service at this moment!